Are you curious how we squeeze five people into a Keystone Passport 2670BH full time? Join us on an RV tour for a peek into our home on wheels! 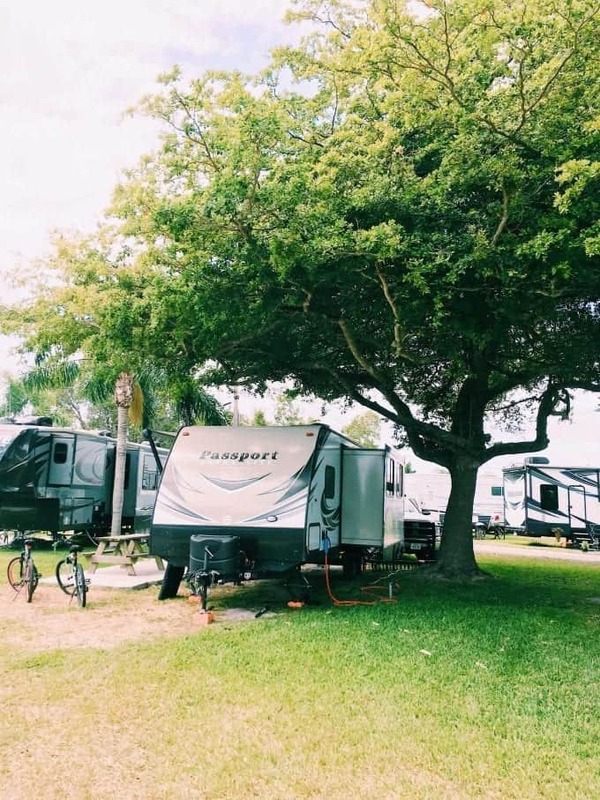 When we first started shopping for a travel trailer to travel in full-time, it was so much fun. 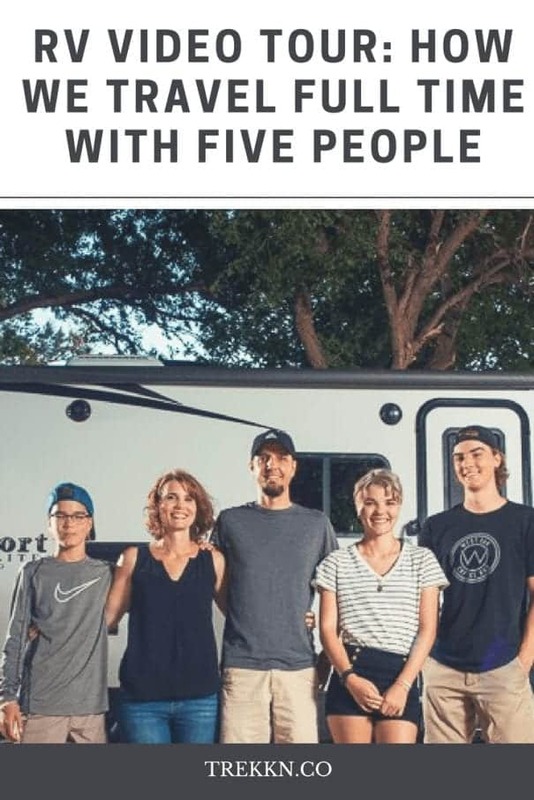 But as time went on, that excitement turned to stress and stress turned into the realization that there was no such thing as the perfect home on wheels for us. We could pick out features from different RVs that we liked and would work for us, but there wasn’t a unit that checked off every box. One had the perfect size beds, but I didn’t like the layout. Another one had a kitchen island I loved, but it was out of our price range. Why Did We Choose the Keystone Passport? In the end, we chose the one that checked off most of the boxes and that just felt right. And that was the Keystone Passport 2670BH. 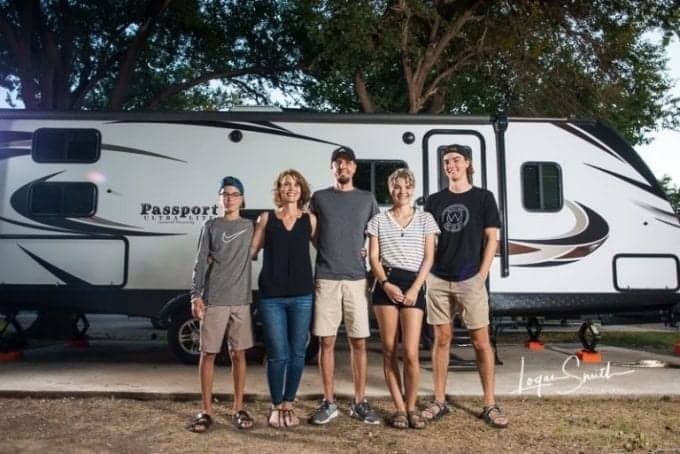 The length – We knew we wanted an RV small enough that we could take into National Parks. It changes park to park, but most of them don’t allow anything over 40 ft. Just be sure to check with the park you’re planning on visiting for exact dimensions. If you have an RV with total length under 32 ft., you should be able to access 80% of the National Parks. This article is very in depth and has a lot of great information. The beds – We needed a unit with beds that were both long and wide enough for our 6 ft. son. I loved the layout of the units with bunkhouses in the back, but those beds were way too small for him. This unit has two full-size beds, which allow him to spread out diagonally. The wrap-around dinette – Quite a few units only had the two bench style seats and we really liked the feel of the wrap around. The master bedroom had doors and it was on the other end of the RV – So many units we looked at had curtains for doors and/or there was a bunk right outside the master. Um, no thank you. I wanted doors (I know, I’m so high maintenance, right?) and I wanted the kids’ ‘rooms’ on the other end. The weight (Just over 5,000 pounds empty) – This unit was pretty lightweight, which allowed us to not have to get a one-ton truck. We’ve been in this rig just over a year and while I’ve had some negative complaints about what I don’t like try to creep into my head, overall we’ve been really pleased with it. 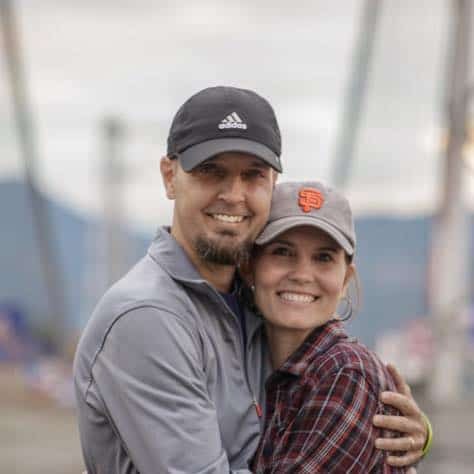 I hope this RV Tour helped you answer some of your full time RV living questions! And since I know you have more questions (I know I had A LOT), ask them in the comments so we can answer them for you. Thank you for the tour and love the trailer! What do you tow it with?